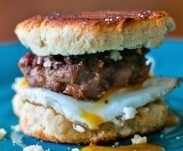 Homemade breakfast sandwiches are quite the staple in our house and making your own sausage is the way to go! How to make sausage patties. Combine the pork, oregano, salt, and onion in a bowl. Once all of the ingredients are blended well, form patties that will fit in the palm of your hand. Make sure to pack them well, so they don’t fall apart on the stove. Heat the oil on a skillet over medium high heat. Cook the sausage patties until cooked through and both sides are browned with crisp edges. If you are making the breakfast sandwiches, remove the sausage and crack enough eggs for the sandwiches. Break the yolks gently and flip once the egg has cooked for a minute or two. Top with cheese and cover for optimal melting! Toast your biscuits or muffin. Sandwich them all together and enjoy!